SoundSynergies is dedicated to providing effective, latest-technology products for the maintenance and conditioning of musical instruments and associated technical gear, primarily marketed through brick-and-mortar stores. It is SoundSynergie’s contention that only actual physical music retail outlets staffed by real people are able to offer the breadth and scope of instrument upkeep and music repair services that musicians need and deserve. SoundSynergies maintenance formulas are ideal for completing the product selection of existing music stores, or as initial offerings for the musical instrument service department that’s just getting started. Fill out the application form below to become a SoundSynergies retailer or distributor. 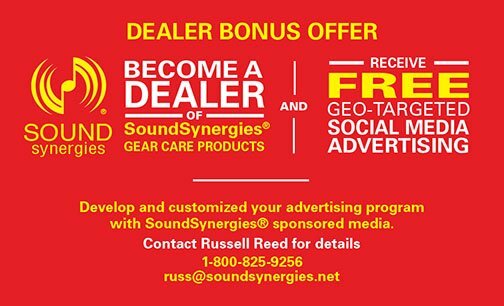 For pricing and availability information on the complete line of eight SoundSynergies® products and private labeling options please fill out the form below to qualify as a dealer or distributor.